With the installation The Camelthorn Code Imke Rust has been awarded the “Prize of Overall Winner” of Namibia’s most prestigious art competition, the Standard Bank Namibia Biennale in 2005. 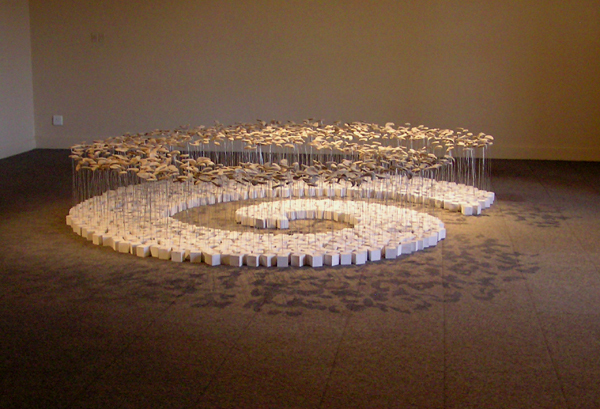 This piece is an installation consisting of 1001 camelthorn pods balancing on wires, which are grounded by white wooden cubes, looking much like of a field of flowers. The 1001 ‘growing’ pods are arranged in a spiral, symbol for growth, life and eternity. Each pod has a little drawing, symbol, word or phrase drawn onto it. The work is a celebration of the secrets and mystery of life, as well as the inherent beauty in all living things. A pod contains the seeds needed to grow several new trees. Once these seeds fall onto fertile ground, receive water and sunshine, they can grow into large and strong camelthorn trees (Acacia erioloba), which are visually very striking and beautiful. It is the most widespread and prominent tree species in Namibia and is strongly linked to the Namibian culture and identity. The tree has many uses. The pods are often used as fodder, since they are very nutritive. The trees grow extremely slow. In Namibia they are protected by forestry legislation. These 1001 pods could potentially grow into a whole forest of camelthorn trees. Since they are suspended on the thin wire stalk, the viewer becomes aware of the delicate nature and their vulnerability – if they cannot fall to the ground and get water, they cannot grow. On the other hand, the potential of growth will always be there, as the pods can survive for many years. But the work also makes us aware of the overexploitation of these pods (collected and removed for fodder for livestock), leading to a depletion of seeds for future growth. It is also a celebration of abundance. Abundance of possibilities, of life, of growth, of ideas and of blessings. The number 1001 allures to the magic fairy-tale number, where anything can happen, all is possible and dreams come true. The virtuous and innocent are always protected and rewarded with blessings. The images and words on the pods heighten the sense of mystery, as they give the viewer a sense of rational explanations, which in fact just lead the brain onto new and different paths. The human mind will always try to ‘connect the dots’, but by that one is made aware that there is no single solution or answer, but a 1001 beautiful possibilities. The work is arranged in such a way that one can enter the spiral, thus enhancing the interaction with the piece. When one enters the spiral one becomes more aware of its symbolic reference to life as well as the sense of one self in relation to the artwork. One also physically experiences the vulnerability of the pods, as one has to move really carefully in order not to knock them over. The idea originated from several different things. I wanted to do something typically Namibian, which was also unique and special. I love trees; I love abundance, life and it’s mysteries and beauty. I wanted to make something, which reminds us to celebrate this and be grateful for the beauty surrounding us. One of my ‘trademarks’ is the experimentation with unusual and different materials, so I thought how can I make an artwork out of a camelthorn pod? The idea of suspending the pods on wire came from a small sketch I once made, and the rest just grew from there. A big thank you to Mr Jensen of Timbercity and to H. Jensen Bau- und Möbeltischlerei, who kindly provided the 1001 wooden cubes, and to my father, Mr Burkart Rust, who provided the wire and tirelessly assisted with packing, installing and transporting this work. ARTIST Imke Rust last week for the second time in five years deservedly walked away as the overall winner of the 2005 Standard Bank Namibia Biennale and N$10 000 in prize money. A large number of people attended the prize-giving ceremony at the Namibia National Arts Gallery on Thursday. “In any competition the first round of applause is not necessarily to commend on excellence, but to acknowledge the courage of artists to take part. The works of arts and crafts on exhibition are indeed a celebration of what is truly and uniquely Namibian,” said Carin de Klerk, head of marketing at the Standard Bank, in a keynote address at the event that was staged for the 26th year. According to De Klerk, the biennale is the country’s first and only prestigious arts festival of this magnitude. “I am amazed and delighted that each year, for more than two decades, hundreds of varied entries come in from all corners of Namibia. For the first time we brought all the art works to the capital, which offered each artist a fair chance for their works to be bought by the public, some of which have been sold,” she said of the works, 58 of whose pictures will now be printed in a glossy catalogue. “I am happy and delighted to have won as overall winner,” said Imke Rust of her achievement and the winning work, titled The Camel Thorn Code, an installation. The spiral-like work consists of 1001 camel thorn pods balancing on wires, grounded by white wooden cubes depicting a field of flowers. “The work is a celebration of the secrets and mystery of life, as well as the inherent beauty in all living things. “When I worked on the concept, I wanted to create something unique and original, something special and inspiring, something very Namibian, which would stand out. I have pushed myself to work ‘outside the frame’ and outside of the normal or mediocre. Furthermore, I made use of very basic components and had to find ways of bringing out the splendour and beauty of a simple thing like the camel-thorn tree, something which is usually overlooked,” she said of the work for which she pushed her own boundaries, perceptions and limitations. Other winners were: in the new signature award, Libbolius Nekundi (Celebrating humanity); in the three dimensional category there were three winners: Kleopas Ngikefelwa for Kaxaxwena, Josia Shilongo for Protection and Anna Iyambo, the Thorn Pot. In the two-dimensional category the winners were: Anita Heystek for The thread that binds us, Paul Kiddo for Neglected Farm and Hans Rack for Elephants from Beneath. In the judges’ view, more needs to be done to improve the technical qualities of art works. “There was no feeling that the artists were breaking the boundaries in design, workmanship or skill development. There should have been more challenging responses to traditional forms and techniques,” reads a collective statement from the three judges. In their opinion, the quality of the works entered was of an average standard, and they stressed that there was need for all artists to work to a much higher and better level. “We were disappointed with the number of works and feel that some of the better and well established artists should have taken part. We are of the opinion that artists should find ways of working together and interact more in order to raise standards and help create functional art, which could make artists economically independent,” the judges said.